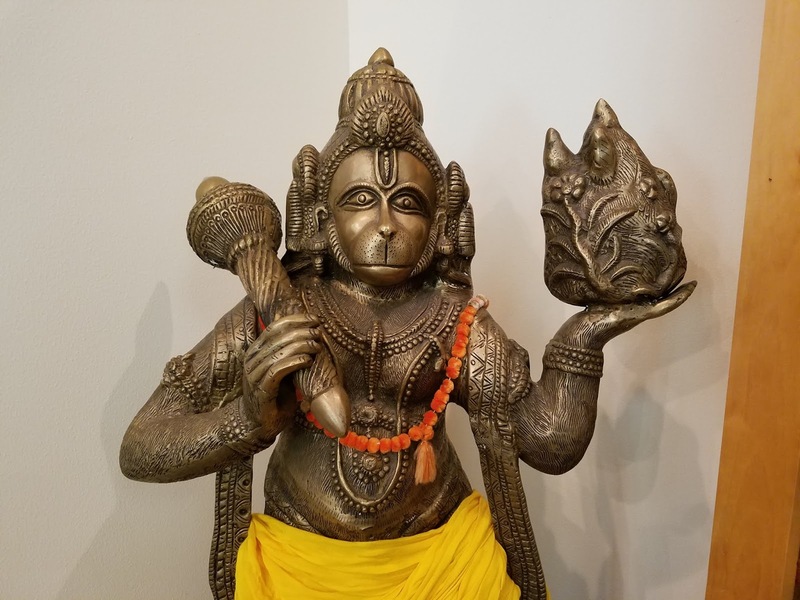 Flashback to the Ram Dass Library at Omega Institute in Rhinebeck where on the top floor lounge you’ll find a brass statue of Hanuman, the half-human-half-monkey Hindu god. 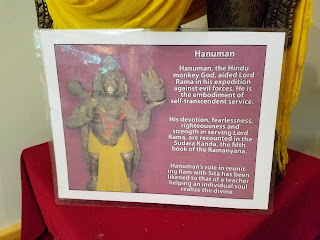 Hanuman has super-human strength and is able to fly. He represents resistance to persecution and in this depiction is seated holding a torch and mountain stone. In Hindu mythology Hanuman was a mischievous child and would use his supernatural powers to prank innocent bystanders and would steal devotional objects from the collections of village spiritual teachers. One day he pranked the wrong meditating sage who in return cursed Hanuman into forgetting his powers—which would return only if someone reminded him of their existence. Brass statues of Hindu deities are popular and come in lots of sizes. The process begins with a carved piece of wax which is covered in cement and heated so the wax melts. It is poured out and the mold is filled with molten brass which hardens into the desired shape. The hardened cement covering is removed and the statue is buffed and polished. Elements of a single statue, such as the items Hanuman holds on his hands, may be created separately and affixed later.